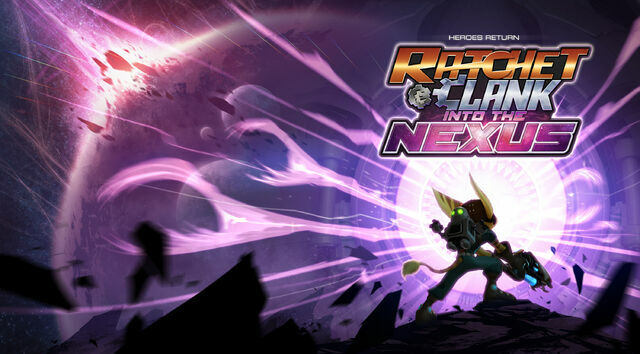 Ratchet & Clank: Into the Nexus (known as Ratchet & Clank: Nexus in Europe) is an upcoming platform game developed by Insomniac Games and published by Sony Computer Entertainment. It is the 12th game overall in the Ratchet & Clank series being the fourth and final installment in the "Future" series. It is set to released exclusively for the PlayStation 3 on November 12, 2013 in North America and November 13, 2013 in Europe. The series is noted for the inclusion of exotic and unique locations, a concept of the traditional Ratchet & Clank experience, that returns in this game. Ratchet & Clank are escorting the dangerous twin criminals Vendra and Neftin Prog to the Vartax Detention Center. After a jailbreak where they both escape, Ratchet and Clank are stranded in an abandoned sector at the edge of the galaxy, arriving on the planet Yerek intending to track down Vendra and Neftin. Yerek contains cities that were once haunted. The duo find out that the Thugs-4-less are keeping the twins safe. They contact Pollyx for help. They eventually stumble upon an inter-dimensional crisis that threatens the universe, forcing Ratchet to make a decision on what's really important. The game will feature new weapons and gadgets as well as some returning ones like the Fusion Grenade and The Warmonger. The game introduces new weapons as well like The Vortex Cannon, when deployed creates black holes sucking enemies in another dimension, the Winterizer, which creates a tornado freezing enemies and turns them into snowmen, The OmniBlaster, a fast shootrange weapon and a Nightmare Box, a device that scares enemies, usually in forms of clowns, an eye or a pirate leaving Ratchet all sorts of weapons to eliminate them. Skill Points, Cheats and Gold Bolts make their return. Gadgets include The Repulsor which suspends enemies in mid-air. Clank also participates in 2D sections referred to The Netherverses which are mind bending puzzles, where Clank must naviagte a treacherous maze while a Nether follows him. The main goal is for the Nether to reach the other side of the rift through Ratchet's dimension Gravity is a vital entity in this game, as it is used to travel to hard to reach places. Characters such as Zephyr, Cronk and Talwyn will return, not forgetting the half-hearted super-size hero Captain Qwark and The Plumber. The Intergalactic Arena will also return. Raritanium is used to upgrade weapons.